Today we have a guest post from Nick Hardman of Betting School Insiders and Nick gives us some pointers for the Chester meeting which kicks off today. Affectionately known as The Roodee, Chester racecourse is a flat left handed course with tight bends. One circuit of the course is just over 1 mile in distance. Horses are constantly on the turn and with such a short run in off the final bend it is very difficult for horses to win coming from off the pace. Front runners and horses that race prominently are those that typically do well here. It takes a particular kind of a horse to win here, a jockey who knows how to ride here and also a trainer who knows the type off horse to be suited by the tight turns of the track. One trainer who has an excellent recent record at Chester is Roger Varian. In the past 3 seasons he has sent out 5 winners from 18 runners at the course to a level stakes profit of £16.20. On Friday evening he runs a 3yo by the name of Tears Of The Sun in 1m 2f fillies handicap (7.20pm). A winner last time out, she is up 6lb and has a handy draw in stall 2. She is Roger Varian’s sole runner at the course on Friday and looks sure to go well. Since 2010, Mark Johnston has notched up 35 winners at the course from 224 runners at a strike rate of 16%. However, he is just 2-23 this season with his horses at the Roodee. Johnston they form a potent partnership. Since 2010 they are 13-63 at a strike rate of 21%. This season though they are 1-10. The Johnston/ Norton combo teams up with Disavow (6.20pm), Alpine Storm (6.50pm), Maracuja (7.20pm) and Crafted (9.00pm). Crafted is the most interesting over 7 ½ furlongs, a trip that has seen the Johnston/ Norton combination bag 3 wins from 7 runners since 2010 for a healthy strike rate of 43% and a level stakes profit of £16.33. Richard Fahey is a trainer who sends a lot of horses to Chester and it is his 2yo runners in non-handicaps who are worth noting. 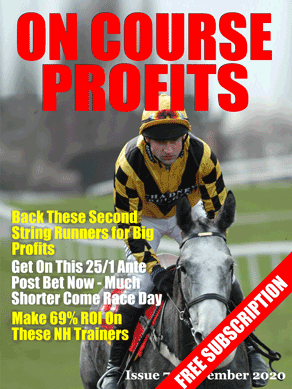 They are 11-39 for a level stakes profit of £22.24 at a healthy strike rate of 28% since 2010. Twenty-two of those runners hit the places and each-way backers would have increased their level stakes profit to £43.63. On Friday he runs 2yo filly Super Quick in the 7f maiden (6.20pm) and she looks to have a cracking chance. There's racing at Chester on Saturday. So my mind turned to the Chester draw bias, but more specifically my thoughts turned to the weather and more specifically how does the draw pan out when the going is soft or heavy. But the sample size will be too small if I restrict the data to just the most profitable distances. So everything below is data for all distances. First off here are the stats for stalls 1 and 2 for different going. Good to Firm is significant but we aren't going to get that tomorrow, so we'll look at that another day. The strike rate for Heavy is huge at 26% but a very small sample. If we break the Heavy runs down by stall. IE the above was stalls 1 and 2. This table shows the breakdown between 1 and 2. That might not look significant because of the low volume of runs, but if we look at the soft table for stalls 1 and 2, we see the stall 2 strike rate is higher again. So in summary very small data sets here (last 11 years) but I'm thinking when the going is Soft or Heavy I'll be thinking about Stall 2 runners more than Stall 1. As promised last week I'm going to share some stats about the draw at Chester which kicks off it's three day meeting today and which is on Channel Four. We talked previously about draw biases not just effecting sprint races and about it being more about going around the bend. Chester is all about the bend with the course being virtually a circle! As we'll see in a minute the bias is all about the starting position in relation to the bend. So here are the stats for the last 11 years for each starting stall. What we see here is that the strike rate for Stall 1 is 19% and for Stall 2 is 18% the strike rate gradually decreases as the stall numbers increase, dropping as low as 2% albeit for lower numbers of runs. Over the long term you can just back all Stall 1 and Stall 2 runners and make a profit at SP, the last four years have all been profitable. Here we can see that the strike rate is highest at 5 furlongs, 5 1/2 furlongs and 6 furlongs. But also at 1 mile 3 1/2 furlongs and 1 mile 4 1/2 furlongs. Lets look at why that might be, with a look at the course layout. What we can see here is that the 6 furlong start is right before a bend, the 5 furlong start is on the bend as is the 1 mile 4 furlong and the 1 mile 3 furlong. All other distance start on the straight. It's also worth noting that the 5 furlong races are not as profitable (ROI) as the others with the high strike rate and that will be because the Chester draw bias is well known and because most punters assume that it will be most effective at the sprint distance and so they over bet the low stalls in those races.